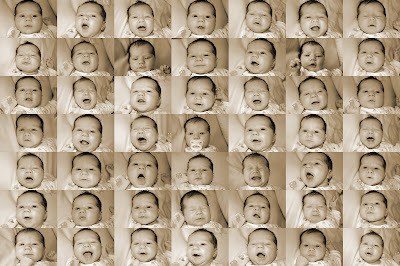 So about a week ago I set out to see how many different facial expressions I could capture on Ava's face. One hundred plus pictures later, I came to the determination that she has a lot of faces. Below are 49 of them. Despite my best efforts, however, I wasn't able to snap a picture of her pouty face, which is among my favorites. Wow Larry...that is impressive!! I must say she's awfully cute with her little faces that she makes!!! I like the "mouth wide open" ones...like she's oh so excited about something!! Anyways...she's adorable...and Krista's mom is right...it would be a good Hallmark card!! So cute!! This is such a fantastic idea! Someday, you shall travel to far-off lands to capture the faces of Brookstina's babies!